This Second Life/OpenSim light is completely invisible, but still lights up the room. Optionally, the light be visible if you wish! 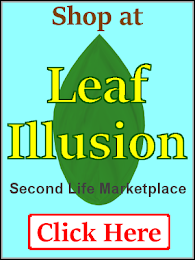 Same instructions... this article will show you how to make the light step-by-step. Can’t see the light? That’s the idea… but it is there! It seemed like there must be a better way so I began brainstorming. The solution for even lighting throughout the room would be a ceiling light. But a boxy ceiling light would be super ugly! Fortunately there is a solution! 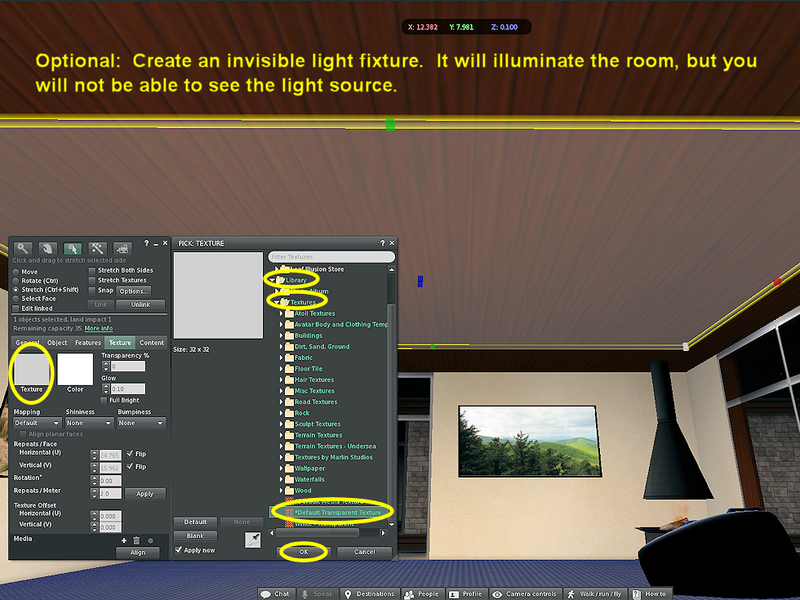 In Second Life a object like a light fixture can be made invisible. But here’s the good part- an invisible light still creates light and lights the room! 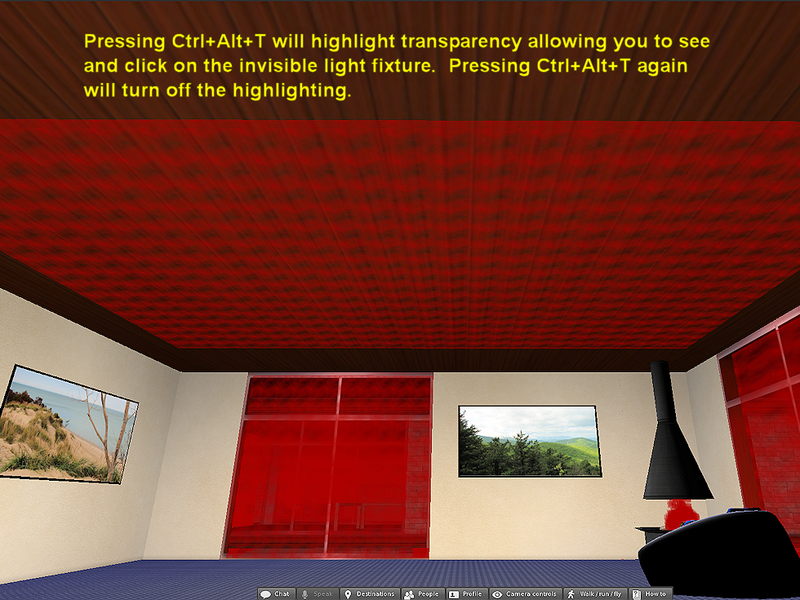 So you can create a invisible light or two for the ceiling of a room. Move them around to concentrate the light where you want it. The room will just seems to be naturally lit from some unknown source. It’s great for taking photos or trying on clothes. It would also work good for work shops and stores where good light is needed for seeing details. But wait, there is no need to run out and buy an invisible ceiling light. Building an invisible ceiling light is super easy, even if you have never built anything in Second Life before! If you would like a visible ceiling light fixture see the separate instructions for how to build a ceiling light fixture in Second Life. 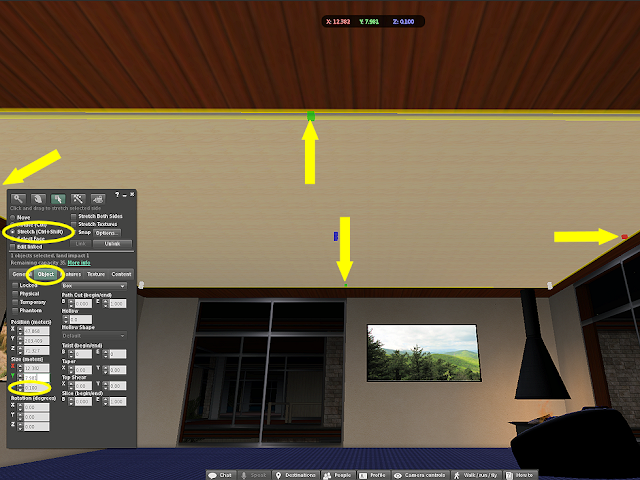 The instructions for the visible ceiling light fixture were created as a first building project guide for Second Life newbies. If you don’t have any experience with building things in Second Life a ceiling light makes a great first project! 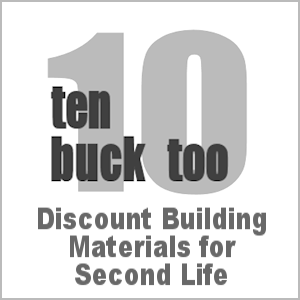 First, I confess that I need to rewrite this lesson based on a better knowledge of how light works in Second Life that has come with more experimenting. I’ve corrected many of the errors in this lesson, so everything here is up to date, but the pictures don’t completely match the descriptions… sorry, I think you will still figure it out easily. Press Ctrl+B then click on the floor to create a box. Click the “Move” button. Click the “General” tab. Move the box up against the bottom of the ceiling. Give the light a name if you wish. Click on the Stretch button. Click on the “Object” tab. Set the Z dimension to 0.1. Click on the red and green boxes and drag the sides of the box to the desired ceiling light size. 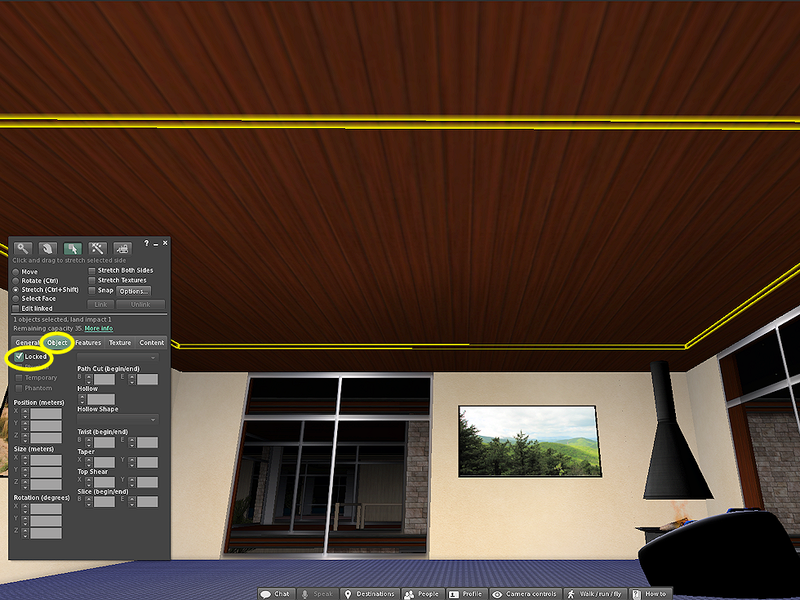 Note: You can leave the light small, 0.5 x0.5×0.1 works just as well as covering the entire ceiling. The "light" originates from the exact center of the prim. You can make it as tiny as you want, but if it is too small it gets to be hard to work with and is easy to lose. A tiny transparent prim can be VERY hard to locate. Click the “Features” tab. Check the Light box. Set Intensity = 1.0, Radius = 20.0, Fall-Off = 0.0 Notice how much brighter the room becomes when you make these changes! Intensity is how bright the light is. Radius is how far it shines from the center of the prim. Fall-Off is how quickly the light fades as it moves further from the center of the prim. FOV Field of View, or the area the light projects onto. Focus Determines how focused the edge of the projected light pattern is. Ambiance Fuzzes the light. Note that projected light will show through objects if the ambiance is set to anything other than 0. Suggest you set to 0. Advanced Lighting Model (Lighting and Shadows) projectors are optional. Most viewers do not display them at any but the highest graphics settings (as of 2016.) Expect this to change over time as users get better graphics cards in their computers (if it is 2018 when you read this I would guess most people now use Advanced Lighting.) The "Advanced Lighting Model" option must be checked in the Graphics Settings in order to use and see the projector lighting and shadows. To turn on the Advanced Lighting Model in your light fixture.go to the Features tab in the object edit window and click the grayed out box with the X in it to the far right of the Light check box. The Pick Texture window will open, select "Blank" in it. You can now edit the Advanced Lighting Model values for your light. You should notice that a beam of light is now projected down out of the bottom of your light fixture (set your sun to midnight.) Start by playing with the FOV value to see what happens. 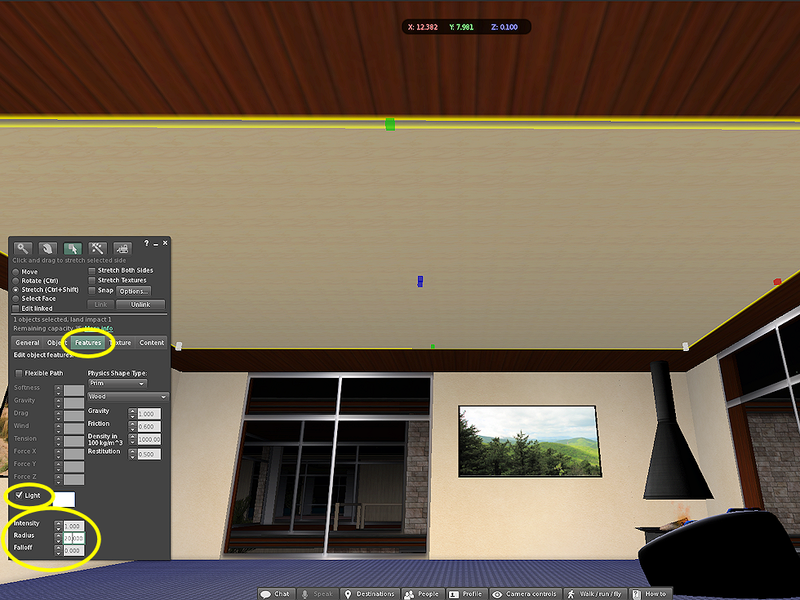 For a ceiling light you will probably want to set FOV to 3.00, Focus to 0.0, and Ambiance to 0.0. Remember if you set Ambiance to anything other than 0.0 the light will shine through walls! See the SL Knowledge Base article on Lighting and Shadows for a much more in-depth explanation. All of these light settings influence each other in various ways, some duplicate much the same effects. Play with them to note the interaction. The basic settings I recommended above give you the maximum amount of light. Important: The “light” is emitted from the center of the prim you created. Just as if there were a light bulb right at the center and the prim were completely clear. 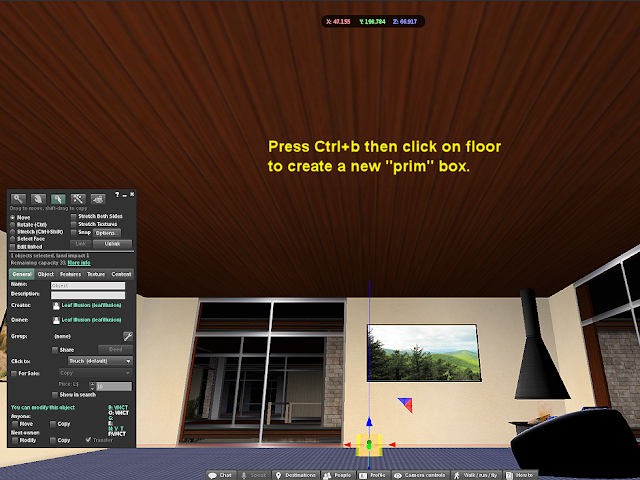 The light is emitted from all sides of the prim, regardless of the color, texture, or transparency used. It doesn’t matter how big the prim is, the light will only be emitted from the center of it. So with the Radius set to 20m the light will shine up to 20m out from the center of the prim. This means that if the prim were a sphere with a 21m radius, the light would not shine all the way to the edge of the prim, because the edge is more than 20m from the center, and the light shines out only 20m from the center. With the advanced Lighting and Shadows settings you can have a lot more control over the light, you can control which direction it projects, as well as preventing it from shining through objects as the basic light does. However also remember that until everyone has better graphics capabilities, many will not see those special effects. For them the light will still behave in the basic way. OK, this step has changed since I originally made this tutorial and the picture above. All you need to do now to make it invisible is look for the "Transparency" setting, and set it to 100%. The use of a transparent texture is no longer required. Setting the light to transparent is optional of course, you can leave the light visible if you want. Lock the settings to prevent accidental changes. Don’t forget to unlock them again if you ever want to make changes! Suggestion (optional): Lock the settings to prevent accidental changes. Don’t forget to unlock them again if you ever want to make changes! You now have an invisible light fixture. If you need to make changes you will want to highlight transparent objects so that you can see the invisible ceiling light. Press Ctrl+Alt+T to highlight the ceiling light. this will allow you to select it for editing. Press Ctrl+Alt+T again to remove the highlighting.